That’s not all! We understand that in this economy everyone could use a helping hand, so DSA is offering a payment plan. You may divide your membership fee into two payments! Take advantage of this special payment plan offer by calling us today at (229) 888-2459. We have enjoyed your support and we continue to support interior designers’ right to practice. We are the only society providing such an extensive portfolio and we hope that you are taking full advantage of your member portfolio opportunity. The benefits increase even more as Google search engines deliver your portfolio information when potential clients search for you online. Also, we are working very hard to establish chapters in your area. Please call (229) 888-2459 if you are interested in participating in your local chapter. As a member, please remember to use the DSA designation after your name and use our logo as much as possible to increase awareness of our association. The logo is in the left hand column and is available for upload after you log in. There is strength in numbers and we are doing our best to support you! Please contact me directly if you have any questions or concerns. While we’re proud of each and every member in this organization, we’re especially proud to announce that Brian Watford, of Brian Watford Interiors of Atlanta, was chosen as DSA Member of the Year for Design Excellence 2010. Check out his online portfolio and we think you’ll agree — Brian is doing same fabulous work for his clients! In 2006, with a degree in Interior Design from the Art Institute of Atlanta and over nine years experience as senior designer for Suzanne Kasler Interiors, Brian Watford established his Atlanta-based design firm, Brian Watford Interiors. It was during his time as senior designer for SKI that he cultivated his thorough knowledge of design, ultimately developing a style and approach to interiors that is his own - fusing classic, understated, relaxed sophistication with modern sensibility and quality vintage pieces. With extensive experience in luxurious residential interiors, Brian provides impeccable service and approaches each project as an opportunity to create something unique. Brian believes creating luxurious living environments is achieved through a keen understanding of each client and maintaining the highest standards of collaboration between all members of the project design team. The core of Brian Watford Interiors’ philosophy is to create an atmosphere that is appropriate for its architectural surroundings and encapsulates the client's lifestyle through a process of exposure, knowledge and creativity. In October 2005, House Beautiful named Brian one of the Top 25 "Next Wave" of designers (under 40) in America. He also earned much professional success in his association with Suzanne Kasler Interiors (with work featured in Southern Accents, House Beautiful, Elle Decor, Atlanta Magazine Home, Atlanta Homes & Lifestyles and the Atlanta Journal & Constitution). Brian has received three ASID Georgia Chapter Design Excellence Gold Awards, including 2008 for a residence under 3500-square-feet and 2009 for a singular space and residence over 3500-square-feet. Brian's undeniable passion for thoughtful, timeless design is evident in his ability to seamlessly blend his creative vision and style with his client's needs and personality, creating that most unique and personal place...home. As I travel around the country speaking at town hall meetings on the topic of anti-competitive interior design regulation, I am frequently asked, “Why join a national organization when legislation is local?” I love it when I get that question because I can give some very substantial, factual reasons. What happens in one state directly impacts every other state. Since 2006, IDPC has helped entrepreneurs in dozens of states resist the push to license interior designers. Prior to 2006, 22 states were successful in enacting some sort of government-mandated title or practice laws. But since 2006, over 100 bills which would have expanded or enacted new regulations have been defeated. The momentum shifted towards less — not more — arbitrary government intervention. The pro-regulation coalitions are stepping up their game. Faced with so much opposition, the pro-regulation faction is becoming more focused and targeted in their approach. They have begun hiring higher-powered lobbyists and are persuading legislators who sit on licensing committees to sponsor their bills. They are inserting carefully worded exemptions in their bills which give the impression of exempting thousands of practitioners, but under close scrutiny do not hold up. This year, for the first time in many years, states like Georgia, Virginia, Alabama, Illinois and Connecticut were successful in passing amendments which expanded their existing title laws, and in Massachusetts and New York “lesser” bills regarding bidding and re-opening the grandfather exemption have been swiftly moving through their legislatures. Once ensconced, seemingly innocuous titling laws prove to be the proponent’s vehicle for incrementally adopting full occupational licensing. The momentum will change. If more and more bills proposing new laws and/or bills to amend and expand existing laws are allowed to pass, the momentum will shift back towards favoring licensing again. Then, for example, a bill that passes in Pennsylvania will be used in California as evidence that this is where the country is going — a so-called “national standard.” Bills passing in adjacent states will be used to create regional regulations, and a snowball effect is created. Our opponents will gain “majority” favorability. With 22 states already affected, we cannot allow more states to fall prey. The Cartel already tells legislators that 26 states are regulated — a false statement used solely to mislead them into believing that a majority of states have adopted regulations. The truth is, they include states that do not have state-mandated, taxpayer-funded, state board-controlled laws — Puerto Rico and Washington DC are not states, Colorado has a permitting statute but does not regulate interior designers, and California has a voluntary, self-certification program with no taxpayer funding or board. This has been one of my main rebuttal points at every hearing I’ve testified in — state activists are seldom knowledgeable about the number of states regulated or other Cartel misinformation, so without IDPC at legislative hearings, those statements would be allowed to stand without confutation. Discrediting proponents’ statements by supplying factual, statistical and empirical evidence has been one of the determining factors in derailing legislation. It impacts other industries. Interior design regulation has a negative collateral effect on other industries whose scope of work falls under the restrictions defined in the legislation, including but not limited to kitchen and bath designers, office furniture dealers, foodservice equipment suppliers, flooring companies, remodelers, stagers, lighting designers, workrooms, decorators, showrooms, etc. In Florida, one of three states with a practice law, and undoubtedly the most aggressive and ruthlessly prosecuted, over 600 Floridians working in over 20 industries/professions have been prosecuted and/or disciplined over the last 5 years. We need to expand our scope. Not only do we need to stop new bills from passing, but we need to work on repealing existing laws, and watch for opportunities to sunset existing government mandated state laws. Stopping new laws from being enacted, squashing amendments to expand existing laws, and repealing/de-funding existing laws — all of this takes a tremendous amount of funding. The Freedom Movement will collapse without IDPC. It is said that “all politics are local.” We agree, and that’s why we strive to raise the level of awareness and work with state activists. While there are also many national and state organizations that assist us — some more than others, depending on the specific state — the Freedom Movement has been described as a three-legged stool (IDPC, IJ and NKBA) which holds up the other organizations and independent designers. IJ litigates important legal challenges but is rarely involved in the legislative process; NKBA is a loud voice, but can only advocate on behalf of their own members; IDPC founded the “Freedom Movement” and is the umbrella for the other organizations and voice for the design community. Everyone agrees that if one of the three major legs should break off, the entire movement and momentum will be jeopardized. IDPC is funded solely through individual memberships and sponsorships from trade associations, state coalitions, and suppliers. No IDPC = No Freedom Movement. Control your destiny and the future of interior design. There are two clear choices: (1) let ASID control the field of design, or (2) fight back so that designers can continue to direct their own destinies. Leadership is mandatory to succeed. The bottom line is, in order to succeed, the resistance must be under the supervision and organization of a national organization. ASID is a national organization — the money and muscle behind the push for regulation. They have a patient, long-term agenda, and are very well-funded having already spent in excess of $7,000,000 lobbying for their own self-anointed test (the NCIDQ) to legally be adopted as the “minimum competency” to practice. The Freedom Movement needs to be coordinated by a national organization with even more patience, motivation and passion to protect the rights and livelihoods of the design community, and preserve their ability to work in the field that they love. IDPC has the passion and commitment. We need funding to continue. And more importantly, we need YOU. This has to be a team effort in order to succeed. Will you help? My latest assignment had me designing a podium room for Corporate America. The placement of tables and chairs had been a standard layout. Occupancy of 30 people was the only requirement. This is when I really get juiced. I love the opportunity to give my client more than what they require, to educate them in a way that has not yet been conceived and show them, through feng shui design, the value of the person-place connection and how the art of placement of the space affects the way a person feels and reacts. My intention was to create an environment that was welcoming with a direct invitation to the relationship area of the room. This was an opportunity to create a sense of community, comfort and trust, qualities that can encourage closing a sale - our ultimate goal! The placement of the coffee station in the far right hand corner of the room brought potential buyers deeper into the space and also gave them an opportunity to refuel by connecting to the lush vista of landscape seen thru the floor to ceiling windows. 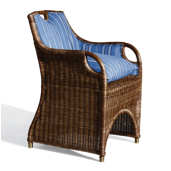 Multiple seating was made available, allowing the client to make a choice. Residential seating was placed for a familiar comfort of home, as well as the standard set up of tables and chairs, all of which lends to creating an invitation for comfort. The placement gave sales agents the opportunity to casually get to know their client before sitting at the tables to listen to the formal presentation. This pause assisted in creating ease. The coffee station placement was positioned in the furthest vantage point from the entrance door, which in Feng Shui Design is referred to as the “command position” or the safest position in the room. Feng Shui uses specific intention as its guide for designing any space. Redesigning the layout and placement of furnishings specifically gives rise to the potency of the art of placement and the person-place connection. If you’re already using Studio Webware, you are well aware of the value of the many apps available. That list keeps growing and now users can experience Designer Market, says Lance Haeberle of Studio Webware, Inc. 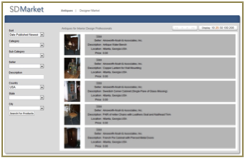 Interior designers using the software on a day to day basis can now use it to manage their entire inventory. The inventory management system allows users to click on a checklist to select items from their inventory to post on Studio Designer Market. “Then they can optimally publish it for other designers to view and purchase from or for the public to view and purchase,” said Haeberle. Many interior designers have websites now, and yet they’re not getting the calls they want or need. Why is that? Just because you have a website doesn’t mean consumers can find you. 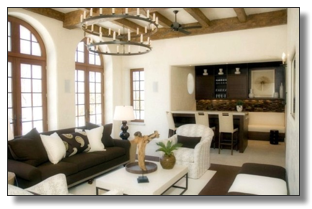 Have you searched for interior designers in your metro area? Do you come up on the first page of Google or Yahoo? If not, you need to do some work. Eighty percent of the calls go to the top three listings on the first page of the search engines. List your site with the search engines. If you do this yourself, it can take many hours, but it is free. I really recommend outsourcing this to someone who does it all of the time. Optimize your site for the keywords that people use to search for interior designers in your area. If you’re really on top of the game, your website address, or URL, includes http://www.interiordesignyourcityyourcompanyname.com. If you don’t have a website address like this, you can register another domain that uses this naming convention and have that forward to your current website address. Your website should be optimized with your keywords, too. This means you should use the keywords people use to find you such as the words above. Use the words that are relevant to your site. Be sure to list your site on Google Maps. Add a blog to your website, and post articles at least once a week with the main keywords for your site. Search engines “crawl” the web every day looking for new content. Fresher content gets higher rankings. If you don’t have a blog attached to your site, then at least update your website as frequently as possible. I recommend a blog because you can update the site yourself. There are many qualified web developers who can set up a template for your site and teach you how to use it. You can even use a hybrid blog template that looks more like a website. Just search on Google for WordPress templates and take a look at the options available. Every website or blog can be customized with your logo, branding and graphics. Remember to write your content to appeal to the emotions of the potential client. Don’t use a laundry list of what you do. Tell your visitors what you do for them. Use Alt-Tags for all photographs on your site. Use similar naming conventions that I mentioned above. “Master Bedroom Interior Design NYC” would be a good tag if you want your images to be found in the city. Talk to your webmaster about your H1 tag (Title Tag), Meta Description and Meta Tags. These must be relevant to the keywords that your prospects use to search for you on the web. If you really want to get found, use a video about your business. Few designers use videos so you’re very likely to get a high search ranking if you use a video with keywords and your URL in the description. Gail Doby, ASID,DSA is co-founder and Chief Vision Officer of Design Success University. Gail is an NCIDQ certified designer with 23 years of experience in interior design. Click here to get your copy of the Interior Design Fee & Salary Survey eBook for 2009 - 2010. The new edition will be published early fall 2010. What is it? Is it something new, a current trend? Is it something you are already doing? How do you use it? What’s the benefit? You, as an interior designer, probably are already using some form of design psychology with great skill. While the perfect client would be one that has unlimited funds and loves whatever you do, the reality is that they all come with some portion of “psychological design baggage.” Often they don’t want to let go of what they have been comfortable with, and change can be difficult. Design psychology (not a scientific field) is basically delving beyond the usual client profile. Discovering what the client wants and what they will be happy with is a tedious but enlightening process. It involves questioning and then questioning the answers you receive until you get to the real reasons and answers. If someone has grown up with antiques and truly loves them, you include antiques in your design. If someone dislikes antiques, you definitely don’t want them present. What’s the reason for their likes or dislikes? Was it because Mom had them? If Mom valued antiques, then they must be okay or there may be a desire to have something totally different. Recently a client revealed the reason she didn’t want a particular plant in her home was that her grandmother had made an ugly facial expression when she looked at and named a mother-in-law’s tongue plant. That experience stayed with her for over 60 years. This was something some might consider ridiculous; however, that particular plant still represents disapproval from a grandmother who was loved and respected. While design psychology involves asking multiple questions, don’t forget to listen and listen carefully. You might also get more information by observing what is not said. Stop talking while you are listening; you can’t do both at the same time. The best question to motivate conversation is “what is your thinking on this?” Always remember to validate someone’s objections. It’s important. “I understand how you feel” goes a long way. By agreeing with the person first or validating someone’s opinion, you can easily slip into your suggestions and recommendations. Investment in a client relationship will help clear the way for better communication and a design that makes everyone happy. The system is perfect for those designers that find themselves with pieces left over following a project. Rather than storing them in a warehouse somewhere in hopes of selling to a future client, they can be listed and sold to another designer or to the public quicker. Showrooms also use the program the say way, but in order to sell showroom floor samples, he continued. Antiques can also be included in the online inventory and “shoppers” can select to view antiques or Designer Market inventory items. Now, 40 years later, Biberaj updates traditional handwork with modern methods. 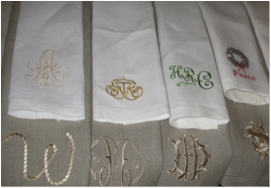 In her Manassas, Virginia, workroom, she uses an industrial embroidery machine to create made-to- order designs for leading interior designers and other clients. 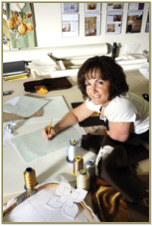 Proprietor and sole practitioner of European Design, Inc., she embroiders familiar motifs and imaginative concepts to exacting standards. Her appliquéd pillows were recently on display on a veranda created by interior designer Kelley Proxmire at the 2010 DC Design House in Chevy Chase. Proxmire based the design of these chocolate-brown pillows with a floral motif and grey thread on the pattern of a carved-wood plaque, and colors she selected for an adjoining sitting room. From Home & Design magazine. Written by Tina Coplan of Chevy Chase, Maryland. I know I need to be marketing to grow my business, but I just don’t know what to do. I wake up in the morning sad and unmotivated because I know I should be doing marketing, but I am not even sure where to start. Please help.~Amanda L., Chicago, Il. There is no question that if you want to grow your business, you must market yourself. Think of your marketing plan as a pizza pie, or a marketing pie. The pie has 10 slices - hence 10 marketing areas. These 10 areas or slices are: traditional networking, referrals & testimonials, editorials & awards, personal branding, partnerships, speaking, social media, online marketing, outside-the-box promotions, and direct marketing. Traditional networking is going to physical networking meetings like trade associations, chambers, business card exchanges, and leads groups. Referrals & testimonials include asking existing customers to help you spread the word about your business. Editorials and awards are about being featured in local and national magazines, garnering media attention, and promoting yourself through public relations. Personal branding is about making sure that everything you do in your design business reflects who you are - from your business card, to how you dress, to what you say, etc. Partnerships serve to secure complementary and non-competing businesses to work together because you share the same clientele. Speaking is getting in front of small or large groups and making a design presentation. Social media is using Facebook, LinkedIn, Twitter, Flikr, and YouTube. On-line marketing is having the effective web-site (notice I didn’t say pretty, I said effective) and using on-line newsletters to communicate with existing and potential clients. 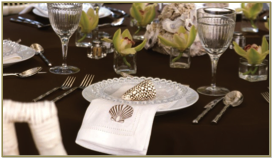 Outside-the-box promotions allow you to be really creative with trunk shows, show houses, and real-estate programs. Direct marketing is about going to consumers through such direct ways as direct mail, phone calls, and flyers. If you’re a novice, my recommendation is to start with traditional networking. This is one of the easiest, most cost-effective and time-tested ways to make connections and grow your business. If you’re a more experienced marketer, I recommend that you tackle the social media and online marketing slices. A reminder for everyone: New or old, referrals & testimonials are the most highly-effective yet most often forgotten ways to market yourself. Finally, know that regardless of how many years you’ve been in business and how many customers you already have, you should never forget about your existing clients (whether you have 1 or 101). Remember that the most effective path to a new best client is through your old best client. Vitalia (Vita) Vygovska is the award winning owner of Vitalia, Inc, an author, and a window treatment & productivity expert. Her company is devoted to giving home furnishings professionals productivity resources that help them make more money, save time, and run a productive and profitable business. To check out her programs, products, and FREE resources, including FREE CD: 101 Window Treatment Ideas, visit www.VitaliaInc.com.